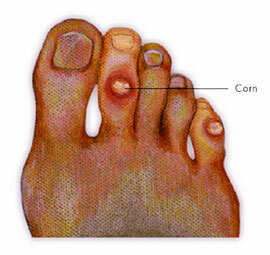 A corn (heloma) is an area of thickened skin tissue on the top of the toes (due to shoe irritation) or in between the toes due to irritation and friction (usually 2nd metatarsal) from a bony prominence. Patients will complain of pain at the site of the corn. Soft corns at the webspace may become infected. Corns on feet are caused or aggravated by abnormal friction (instability or over-pronation) occurring between bony prominences and also because pronation causes the foot to function like a “loose bag of bones”. The result is hypermobility of the foot, causing the bony prominences to irritate and break down the soft tissue between the toes. When the “loose bag of bones” phase goes on too long, the skin is trapped between the bony prominences in the foot and the inside of the shoe, causing friction and irritation. The skin of the foot thickens to protect itself from the irritation but then leaves even less room between itself and the inside of the shoe, resulting in pain. Temporarily the corns on feet can be cut away; however, since the problem is made worse by overpronation, the patient should be fitted with an orthotic device that restricts the instability and reduces friction. The patient will likely experience comfort and relief within weeks.